We're delighted to have Katya de Becerra with us to share more about her debut novel, WHAT THE WOODS KEEP. Katya, what was your inspiration for writing WHAT THE WOODS KEEP? I wanted to write a book a teen-me would be super excited to read - a book that would have a powerful female friendship at its core and feature stubborn, willful girls entangled in a dangerous mystery. I also always wanted to pay a proper tribute to one of my childhood's major obsessions, the Nibelingenlied, which kept on haunting me throughout the years until it eventually became the main inspiration for my debut. In YA, I'd say PASSENGER by Alexandra Bracken and THE HAZEL WOOD by Melissa Albert would be the closest in style and atmosphere to WHAT THE WOODS KEEP. Outside of YA, I've heard my debut being compared to NIGHT FILM by Marisha Pessl and THE HISTORIAN by Elizabeth Kostova - and I'm definitely very happy with these comparisons! I had two major AHA! moments with WHAT THE WOODS KEEP. The first one came in midst of agent querying when I realized my book had to significantly stand out from many others in the same genre in order to entice anyone to offer representation. To address this, I decided to add multimedia components to complement the first person narration in order to expand the narrative and ensure there's more depth to the story. My second AHA! moment occurred when I was fleshing out my main protagonist, Hayden. It made a lot of sense for her to draw on science (e.g. scientific theories) when trying to solve the mystery at the heart of the book. Making Hayden refer back to the concepts and ideas from the history of science in her narration was a major breakthrough for me when writing this book. I need ABSOLUTE SILENCE when I write. Since that's impossible to achieve in real life, I have to compromise: I can usually be found writing with white noise machine blasting in full force in my headphones. Write for yourself. Don't chase trends. Read a lot of books - in and out of your genre. Be professional. I'm currently revising my second book - OASIS - which is due for publication in Fall 2019, while also working on my next book - an alternative history YA Cold War thriller inspired by the works of Brothers Strugatsky. Katya de Becerra was born in Russia, studied in California, lived in Peru, and then stayed in Australia long enough to become a local. She was going to be an Egyptologist when she grew up, but instead she earned a PhD in Anthropology. Katya is a short version of her real name, which is very long and gets mispronounced a lot. 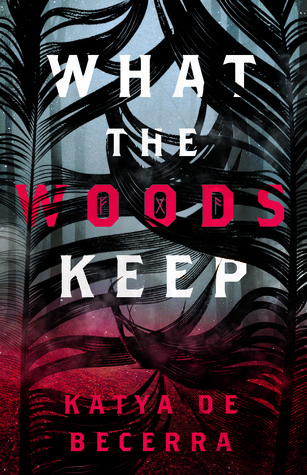 What The Woods Keep is her first novel (out in September 2018). Katya's second book, Oasis, is forthcoming in 2019. She loves connecting with readers and fellow authors, so please get in touch @KatyaDeBecerra or at her blog. Have you had a chance to read WHAT THE WOODS KEEP yet? Have you tried adding multimedia components to complement your writing? Are you reading a lot of books both in and out of your genre? Share your thoughts about the interview in the comments!